It’s a shame Steve Carell is leaving the show but at least we have The Office Season Six on Blu-ray to look forward to. What’s more, upcoming Season Seven episodes (a total of five) will be viewable via BD-Live after their television broadcast — a first for Universal Studios Home Entertainment and a first for Blu-ray. The 4-disc Blu-ray box-set will contain more than two hours of deleted scenes, featurettes, two extended webisodes, My Scenes, the pocket BLU app, a blooper reel, and a digital short “The Podcast.”. The Office Season Six episodes will be presented on four BD-50s at 1.78:1 widescreen aspect ratio. Video resolution is 1080p coded in VC-1. Audio is formatted in DTS-HD Master Audio 5.1. The Office stars Golden Globe-winner Steve Carell (Get Smart, 40-Year-Old Virgin), Jenna Fischer (Walk Hard), John Krasinski (It’s Complicated), and Rainn Wilson (The Last Mimzy) among others. Special guests during Season Six included Christian Slater (Bobby) and Kathy Bates (The Blind Side). The Office Season Six will release on Blu-ray and DVD Sept. 7, 2010. Season Seven will premiere September 23, 2010. 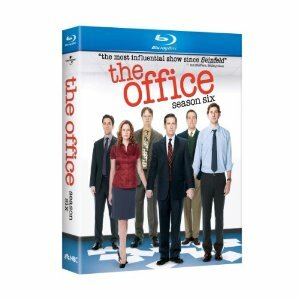 Pre-order The Office: Season Six on Blu-ray Disc and get $4 credit towards Amazon Video On Demand as well as Amazon’s pre-order price guarantee.